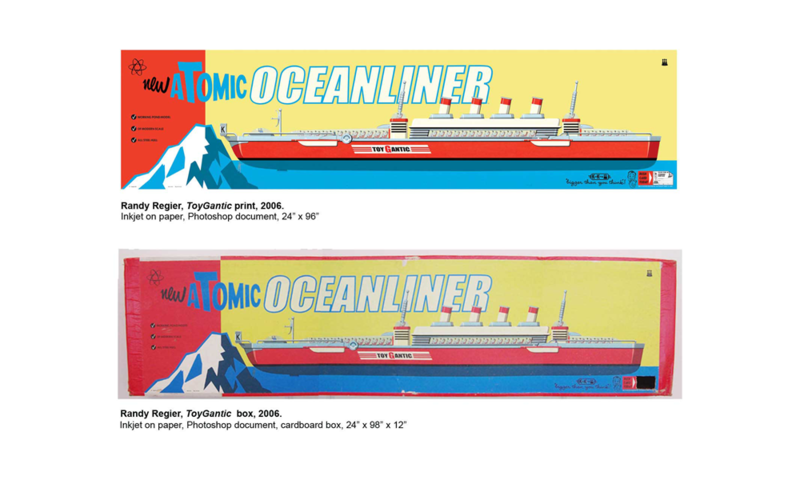 In the summer of 2005 I built a toy oceanliner called the ToyGantic, it was conceived to be a sort of atomic-age Americanized toy version of the historic Titanic (it’s over 8 feet in length). 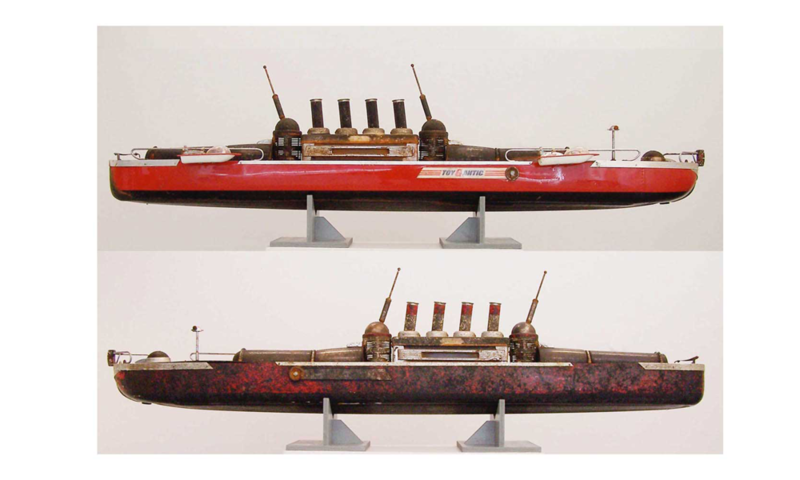 I have for many years been fascinated by the number of toy ships that must be strewn across the bottoms of ponds and lakes all over the world. I wanted to have the experience of finding one of the rarest and most unusual ever made so I created the opportunity and enacted it. I sank the ToyGantic in a private pond near Rockland, Maine in August of 2005 and raised it in July of 2006. Over the course of the year that it lay on the pond bottom, I created a fictive historical narrative and some related ephemera to explain its origins, and the reason for its demise. As I dealt with the conceptual nature of this work it became a much more complex endeavor than I had originally imagined. Ship: Aluminum, Steel, plastic and automotive acrylic urethane finish. Box: Cardboard with Photoshop rendered label. Also included: ‘vintage’ comic book, photographs of Kid King building (both Photoshop rendered), collection of ‘new old stock’ plastic stowaway bow plugs and one that appears to actually have been used. Photos of ToyGantic on the lake bottom as found, and contemporary toy collectors catalogue with ‘stowaway bow plug’ featured in unidentified plastic figures section (Photoshop). Dimensions in box: 96″L x 12″W x 24″H. Collection of the Marianna Kistler Beach Museum of Art at Kansas State University, Manhattan, KS.